Clarice Richards was born in Ohio and spent considerable part of her life there but then in 1900 moved to Colorado, to Elbert County. At that time she was affianced with Jarvis Richards, a former Congregational minister who also came from the East coast. The couple was willing to settle down there but mountainous Colorado at first did not welcome the easterners. Clarice, however, was persistent and tried to see the life easily from the humorist point of view. Slowly she was westernized getting used to farmers. 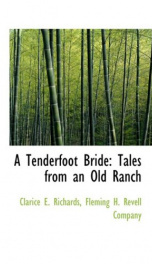 A tenderfoot Bride Tales from an Old Ranch is her memoir that was published first in 1920, became popular very soon and was recognized as a charming and nice story. The book also contains the introduction written by Maxine Benson who explains the life in the West on farms and ranches, particularly of that of Richard's family.